Monster Energy Supercross is an indoor dirt bike racing championship - a newer version of motocross, the sport’s original form. Whereas motocross takes place on long courses built primarily on the dirt and terrain offered up by nature, Supercross races are made from dirt hauled into stadiums. Monster Energy Supercross is held from January through May in open stadiums (in cities with nicer weather) and covered domes. The track takes all the exciting obstacles of outdoor riding—jumps, turns, and bumps—amplifies them, and puts them in easy view of spectators. There are two divisions racing: the 450SX Class and the 250SX Class. Top riders like Ryan Dungey, Chad Reed, Ken Roczen, and Eli Tomac are in the premier 450SX Class, and they ride 450cc four-stroke motorcycles. The 250SX Class is populated primarily by younger riders on 250cc four-stroke motorcycles. The class is split into East and West Regions, each of which crowns its own champion; with the exception of the series finale, you’ll only see one region in action at each round. At the final race of the season in Las Vegas, the East and West regions meet in the Dave Coombs Sr. Memorial East-West Shootout. The primary brands you'll see racing are from Japan (Honda, Kawasaki, Suzuki and Yamaha) and Austria (KTM and Husqvarna). These motorcycles are highly modified versions of what you can purchase at your local dealership. The transmissions feature four or five gears, and the shift lever is by the left footpeg. The rear-brake lever is by the right footpeg, the clutch lever on the left side of the handlebar, and the throttle and front brake on the right side of the handlebar. Bikes can be any color, but teams generally stick with the same colors as the stock machines. Most bikes are four-strokes of either 250cc or 450cc displacement. A Supercross bike can generate nearly 70 horsepower and weighs around 220 pounds, giving it a better power-to-weight ratio than a top-level NASCAR vehicle. The numbers 250 and 450 refer to the engine size, as measured in cubic centimeters of displacement (cylinder bore x piston stroke). The 450s boast more power and torque than the small machines, but they're also more difficult to control and weigh a bit more. The 250s tend to rev higher, while the 450s sound a little more "grunty." The actual lap times between the two bikes are similar, but in a head-to-head race, a 450 can out-jump a 250 and make passes by accelerating harder out of turns-- that's why the fastest riders use the bigger bikes. A Supercross track represents the ultimate evolution of the sport. Among the many obstacles riders must negotiate every lap are whoop sections (brutal washboards where riders skim along the tops of the bumps), rhythm sections (irregular series of jumps with a variety of combination options), and triple jumps (three jumps in a row that riders normally clear in a single leap of 70 feet or more). Many of the turns have banked berms, but some are flat. It takes roughly five hundred truckloads of dirt to make up a Supercross track. Soil conditions can be hard-packed, soft, muddy, sandy, rutted, or any combination thereof. Average riders would find it impossible to even do a lap on a Supercross track, let alone race at high speeds. 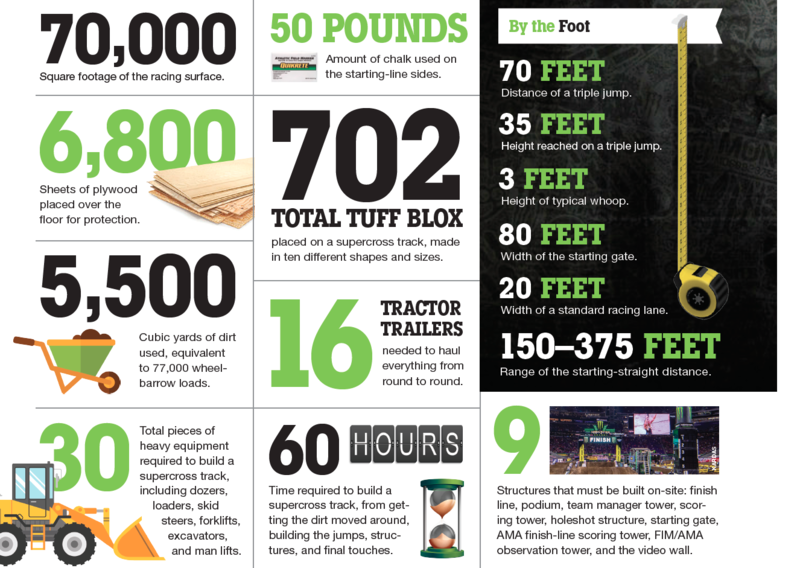 5,500 cubic yards – The average amount of dirt used to build a Monster Energy Supercross track. 6,800 sheets of plywood used to protect the grass/field underneath. Placed end-to-end, the sheets would stretch for over 10 miles! 4 Monster Girls working the floor per event. 100+ Fireworks/ Pyro elements used in the opening ceremonies at every event. 70 feet –The distance of a Monster Energy Supercross triple jump—the same as two school buses parked end-to-end. 3 feet – Height of a typical Supercross whoop. While the riders make skimming across their tops look effortless, the obstacles are about waist-high to an average adult, making them an intimidating section of track for almost any rider. 40 riders qualify for the night show, 22 riders line up for the Main Event, 1 Winner takes home the trophy! Each class has a Main Event at night’s end—15 minutes + 1 lap for the 250SX Class and 20 minutes + 1 lap for the 450SX Class. 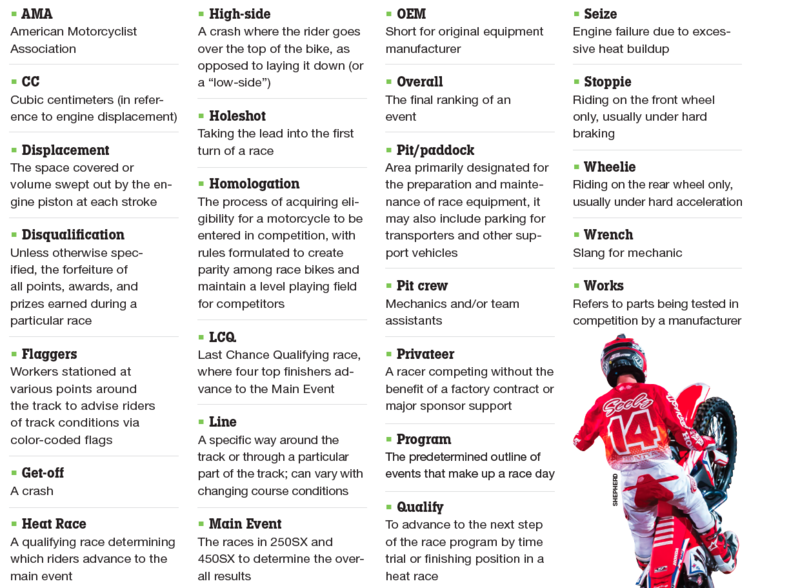 A Supercross starting gate can only take a maximum of twenty-two riders, so fields must be whittled down. During the afternoon practice sessions, each racer’s laps are timed via electronic transponders, and the top forty in each class make it into the night program. Once there, riders take part in one of two Heat Races per class. Riders who qualify from the Heats go directly to the Main Event. Riders in the 450SX Class who don’t qualify in the Heat Race go to a Semi Final race, and those who don’t qualify there get one last shot in the aptly named Last Chance Qualifier. In the 250SX Class, riders compete in just a Heat Race and a Last Change Qualifier to seed the Main Event. Riders who don’t make it into the Main Event are finished for the night and will receive no series points that weekend. For the first time in over two decades, the 2018 season will debut an all-new Main Event points system to allocate points over all 22 finishing positions. The Monster Energy Pit Party is a key part of the atmosphere at Supercross races. Fans can arrive early to meet their favorite riders, see the bikes up close and take in various pit activations. At select events, Monster Energy will pull out all the stops and bring out BMX athletes, the Harley Unknowns as well as drift trucks. Check Supercross event pages for more information. New to Monster Energy Supercross? Need to brush up on some of the changes? Here's a rundown on qualifying, the season's unique races, and much more. The most important part of any race is the very beginning. Starting up front is key to finishing there, as even a 20-minute + 1 lap Main Event rarely provides enough time to pass 20-some riders. Racers begin by lining up against a gate that guarantees everyone leaves at the same time. They choose their positions in the Heat Race based on practice times and in the Main Event on qualifier performance. 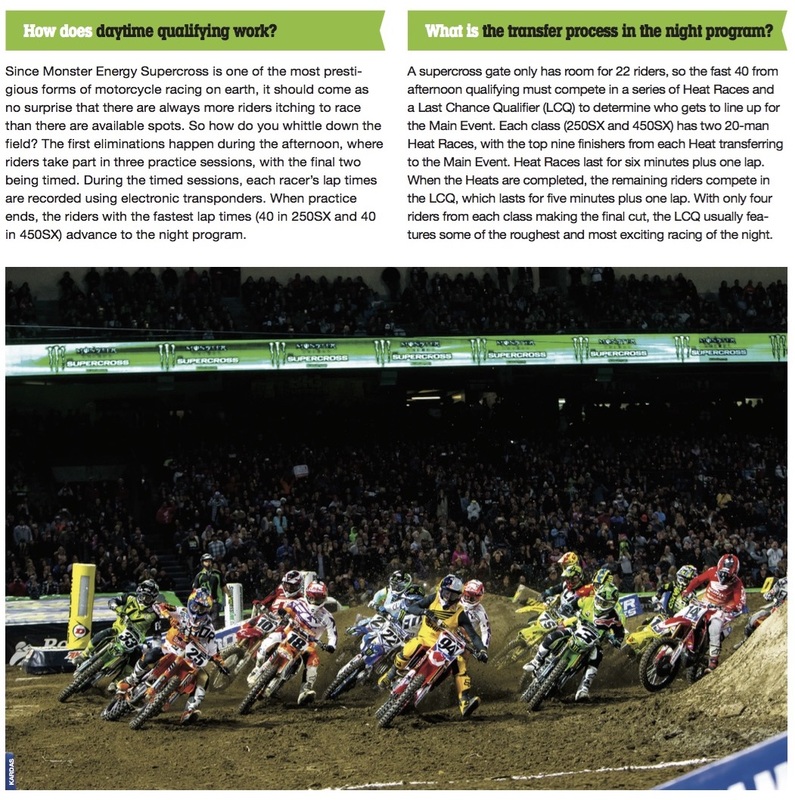 In Supercross, riders generally prefer the straightest line possible to the first turn, usually toward the middle of the gate. Once riders are lined up, a 30-second card is displayed, indicating that the gate will drop in about that much time. Five to ten seconds before the gate drops, the card is turned sideways. The gate drops backward and will trap anyone who attempts to jump the start. The first rider to cross the chalk line in the first turn—by utilizing quick reflexes, throttle control, power, and good traction—has earned the holeshot. In this video, Western Regional 250SX rider Chris Alldredge walks you through the technique to grabbing the all-important holeshot. Riders are not allowed to wear radios in their helmets, so they get information in other ways—specifically, via color-coded flags. Yellow (with accompanying yellow flashing lights) warns that another rider in down or stalled ahead; blue informs a rider he’s about to be lapped; crossed white and green flags at the finish tell riders the race is at the halfway mark; white indicates one lap remaining. Of course, the checkers come out for the finish. Teams communicate with their athletes by writing messages on dry erase boards and holding them out as their riders pass. These pit boards can only be displayed in the designated mechanic’s area. Rarely, a red flag will be displayed, indicating a premature end to the race. A red flashing light at the beginning of a triple jump means a rider is down and racers should roll the jumps and not attempt passes. Most of the riders you see are backed by sponsors—some more so than others. Factory squads are run directly by the manufacturer of the team’s bikes, with riders earning lucrative salaries, riding meticulously prepared equipment, and being supported by technicians, engine suspension specialists, test riders and mechanics, PR workers, truck drivers, and so on. Factory riders often use their own salary to employ trainers, agents, and practice mechanics. Satellite teams receive support from a manufacturer but are run privately; budgets vary widely among these outfits. Riders who pay their own way to the races are called privateers, and although many still have equipment sponsors to help ease the financial load, they’re still the working-class heroes of Supercross racing. The best way to identify any Supercross rider is by his rider number, which is acquired in a few different ways. 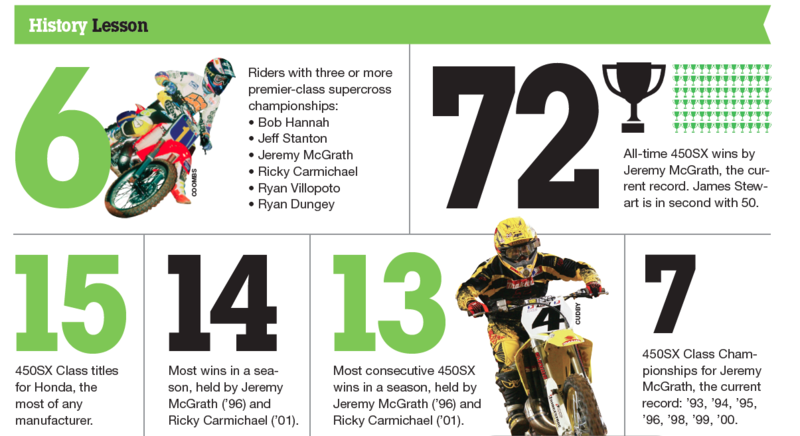 Riders who have won national Supercross or motocross championships earn the right to single-digit career numbers, although they can also choose a two-digit career number. Riders who finished in the top ten overall in a combined Supercross/motocross season earn the right to claim permanent numbers as well. Beyond those, riders earn up to number 99 though total points accumulated during the previous Monster Energy Supercross and Lucas Oil Pro Motocross season. Riders who don’t earn a number from 1 to 100, including rookies, can choose numbers between 101 and 999. 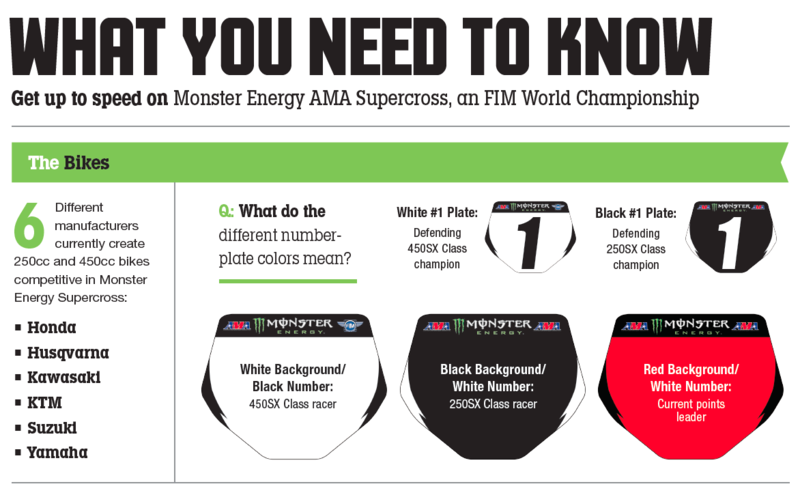 Number plates provide a quick way to identify which class is on the track: 450SX Class bikes run black numbers on white backgrounds, while the 250SX Class uses the reverse. Plates are on the front and both sides of the bikes. You’ll also notice red number plates in each class, which are reserved for the current series points leader. If two or more riders are tied for the lead, each will use a red plate. 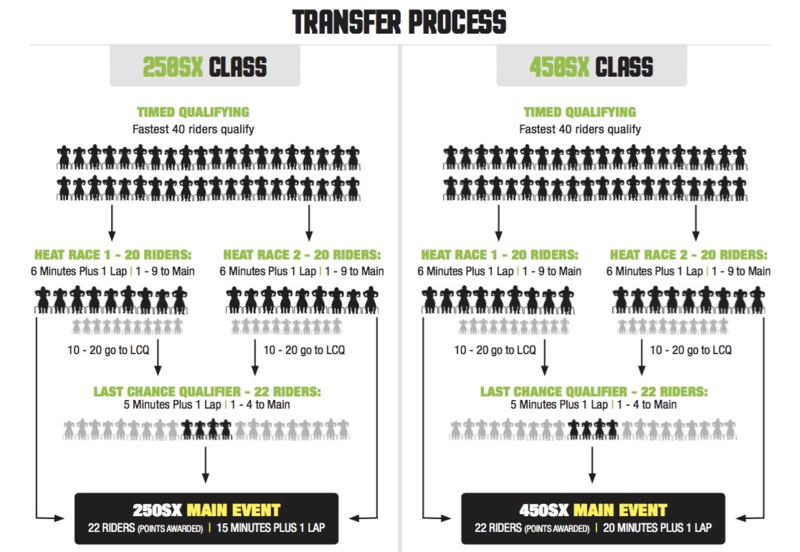 Every round of Monster Energy Supercross is extremely important, because every Main Event pays points toward the championship. The higher you finish, the more points you earn (25 for first, 22 for second, 20 for third, and so on). Wins are obviously important since they award the most points, but so is consistency and avoiding injury. The 450SX Class riders compete for points at all 17 rounds, starting with Round 1 in Anaheim and ending with Round 17 in Las Vegas. Two championships are awarded in the 250SX Class—one for the Eastern Region and one for the Western Region; these riders compete in eight races each to crown a champion.